Easily the most picturesque castle on the planet, Neuchwanstein, located in the hills near Füssen, Germany, high above the village of Hohenschwagen in southwest Bavaria has served as a backdrop for countless movies as well as the inspiration for Disney’s Sleeping Beauty Castle. Construction of the Romanesque Revival style castle started in 1869 and the castle on the hill was completed in 1886. Commissioned by Ludwig II of Bavaria, Neuschwanstein was designed as a personal retreat and was paid for by Ludwig himself rather than the people of Bavaria. It was intended to be the home of Ludwig II, but his death in 1886 meant that he was never able to live in the castle completed the same year. In 1866 Bavaria and Austria lost a war against Prussia and Ludwig II had his rights to dispose over the army removed. Since he was no longer considered to be the sovereign ruler of the region he started building a castle that would serve as the centerpiece of his newly planned kingdom. With Neuschwanstein as the new castle from which he could serve once again as king, Ludwig II started building just three years after being demoted in his own kingdom. 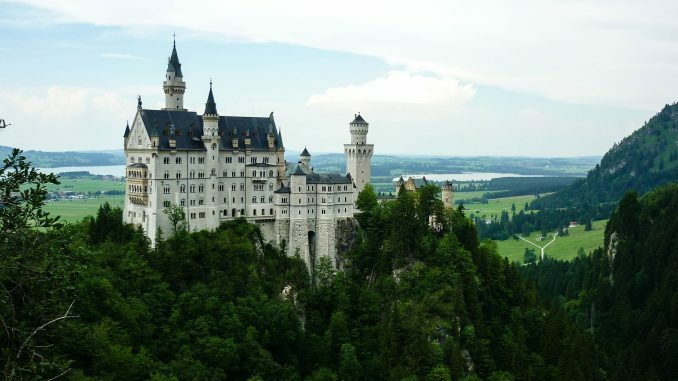 It was a mere seven weeks after his death that Neuschwanstein was opened to the public, and the private refuge built by the notoriously shy king as a means to withdraw from public life and start anew, became one of the most visited tourist attractions in the region. 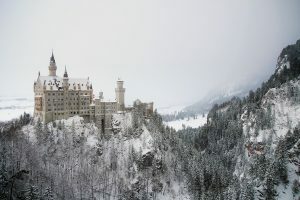 Neuschwanstein in winter is beautiful but visiting can be quite difficult. More than 1.4 million people visit annually, with as many as 6,000 per day in the summer. The palace has appeared prominently in several movies and served as the inspiration for Sleeping Beauty’s Castle at Disneyland. Neuschwanstein is one of the most popular castles in Europe. Though it was designed as palace of the king, there was never a throne built in the throne room. total square footage at roughly 65,000 square feet. At the age of 18, Ludwig II became King of Bavaria but only reigned for two years before Bavaria’s military powers, were seized by Prussia. Ludwig II was not a sovereign ruler at the time of Neuschwanstein’s construction. Neuschwanstein Castle, translates to New Swan Stone castle. Though it looks much taller because of its elevated location, Neuschwanstein’s highest tower only reaches a height of 213 feet. Visiting Neuschwanstein requires at least a short trip to the village of Hohenschwangau since that’s where the ticket center is located. Try to avoid the peak summer months of July and August. While the weather is generally great, the lines will make it slow going and the considerable crowds will make it louder than it should be. The number of visitors drops between November and April so this off-season is a great time to visit. Visiting in the winter however has its own problems. If the weather is too cold and there is snow on the ground it may be impossible to make it through the winding roads to the castle. To avoid long lines, get to the Ticket center in Hohenschwangau before it opens or after 3:00 in the afternoon when the crowds begin to thin out a bit. If your are visiting in Autumn, Neuschwanstein makes a great day-trip during Oktoberfest. The Marienbrücke (Mary’s Bridge) viewpoint is considered to be one of the best, but it is often blocked off during the winter months.